In this polymer clay and resin tutorial for Steampunk-style pendants I show how to make a heart-shaped pendant using some cogwheels from a mechanical watch. The glass-like finish on the pendant is created with two-part epoxy resin. The techniques you will learn with this tutorial can be used for many future projects, and every pendant will be unique. More than thirty big full-color pictures showing every step. 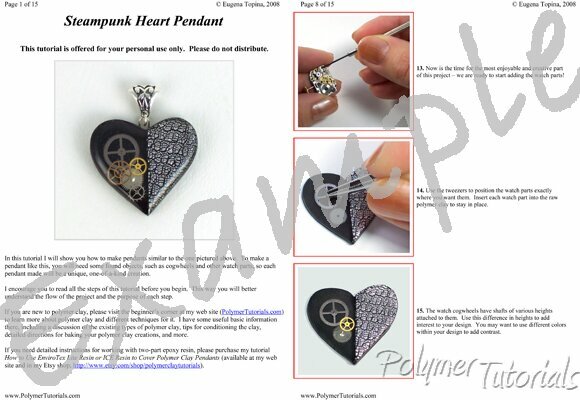 The first two pictures on this page show the pendant described in this tutorial. The last two pictures demonstrate the possibilities of the techniques explained in this tutorial. Place a mouse over the small pictures to see them enlarged. Note: If you need additional instructions for working with two-part epoxy resin, please refer to my detailed step-by-step tutorial How to use EnviroTex Lite or ICE resin. I made my first one last week and not too bad for my first e ..